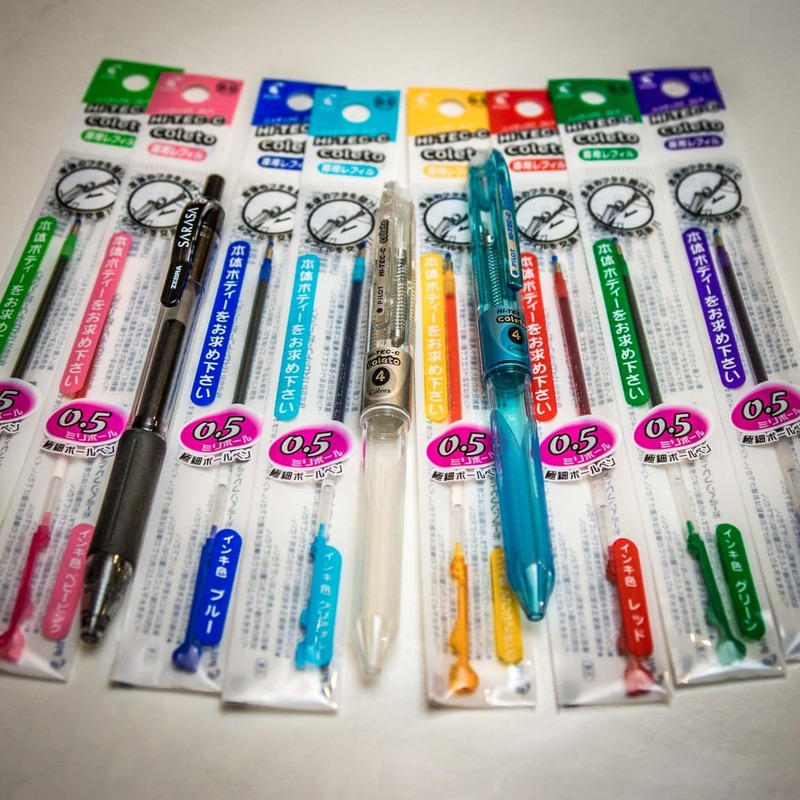 Last summer while I was in Japan, we went to the stationery store and I saw these cool multi-ink pen components. I think my wife created one but for some reason I didn’t make one. But I do like taking notes using different colored pens and instead of carrying around three pens for a total of three colors, I finally decided to get a multi-ink pen. After a little research I found myself at jetpens.com ordering 2 pen bodies, and 8 inks to load into them. There were a few different brands and models and I went with the Pilot Hi-Tech-C Coleto pen system. For the first pen, I went with a plain clear body, which I filled with a standard set of colors – red, blue, green, violet, but for the other pen I got a light blue body and a brighter set of colors – “Clear Blue”, “Apple Green”, “Baby Pink”, and “Apricot Orange”. These two pens are AWESOME! I love writing with them. Having all these colors literally at my fingertips makes note-taking a lot more fun and the notes are much more organized. I’m pretty happy with the colors I chose and how they look together on paper, but of course now I want to get a third body for even more color options. It’s fun! On a side note, I did buy one other plain black pen (you can see it in the picture). It’s a Zebra Sarasa model, with 1mm tip. I love the super-thick strokes it makes. For the multi-ink pens, I went with the thickest available, which is .5mm. Check out this video about the Pilot Hi-Tech-C Coleto pen system and order yours today! !